Driving for Better Business has just launched its new Grey Fleet Review, looking at the 14 million private vehicles used for business on the nation’s roads. It is the first of what will be a series of in-depth reviews into topics that can have a significant effect on both the risk profile and the operational costs of any organisation. Delivering fresh analysis of the disadvantages – as well as some of the advantages – of privately-owned cars being used for work in the public and private sectors, the review is an invaluable guide for leaders, fleet managers, drivers and policy-makers. Explains why grey fleet can be bad for employers and employees. There is no doubt that grey fleet has a role to play in keeping the wheels of industry and the public sector turning. But, as we show, this comes at a cost. Is grey fleet still a viable solution or should we be looking to replace it in the 21st century? John Pryor, Chair of ACFO and Stephen Briers, Editor-in-Chief at Fleet News, give their views. The publication outlines duty-of-care and liability dangers for organisations running grey fleet vehicles without proper policies and checks in place – and how employees can be caught out financially if they fail to do the sums. 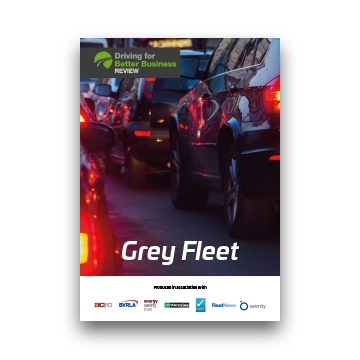 The publication also brings the authoritative Getting to Grips with Grey Fleet report – published by the Energy Saving Trust and the British Vehicle Rental and Leasing Association (BVRLA) in 2016 – up to date, with both those organisations looking at how the emphasis on grey fleet has changed since the report was published. The publication also examines the most effective ways to better manage the risk of grey fleet, including a look at how bespoke car clubs and short-term rental can provide a tailored solution, it outlines the thoughts of leading DfBB Business Champions on the subject, and explains why ‘cash allowance’ means companies are losing an element of control that is vital for monitoring safety, emissions and compliance. Has Britain begun to change its travel habits? Does grey fleet have a future? Far too few companies manage their grey fleet drivers adequately. Can You Really Ditch Your Grey Fleet? Enterprise show how it could save you time and reduce both costs and emissions. Research shows that grey fleet drivers across Europe are not undertaking basic vehicle maintenance. Excessive costs and emissions means grey fleet is an issue that needs to move with the times. Companies are losing essential controls for monitoring safety, emissions and compliance. Many businesses with active grey fleets simply do not realise the level of responsibility they have. Expenses experts Selenity found 21% of grey fleet drivers are failing insurance checks and may not be eligible to drive for work purposes. How do our Champions manage Grey Fleet? Examples of how a selection of our Driving for Better Business Champions manage their grey fleet.